Next month, on Friday 19th of April 2019, Jamaican Reggae artist Max Romeo & The Charmax Band will perform at La Clef in Saint Germain-en-Lay, France. 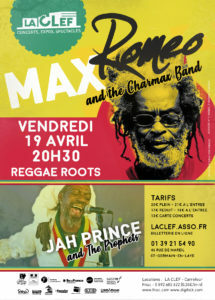 The show will be opened by Jah Price & The Prophets. In April, the Jamaiacn artist also plans to perform in Brighton (UK), Manchester, (UK), Many-le-Hongre (France), and Strasbourg (France). If you have never seen him perform live before, and you happen to be around at that time, you should go check him out. So get your tickets now!